In my last post about this special event, I mentioned that Rainbow Feathers from Silver and Gold Chocobos — both which like to keep a low profile and tend to hang around hard difficulty battle sets — were needed to unlock paths to obtain cute little chocobo familiars. It turns out that it isn’t the case for one of them! After I collected the treasure from the gold chest in the northwest part of the map, a new route appeared with a lock that could be undone with regular chocobo feathers. I was so happy to see that it led to one of the nodes with a cage. ^-^ And I was even more delighted to discover that it was the path to the chocobo chick! Chocobo chick get! Another lock also appeared. Ugh. This one’s to a silver chest though. The screencap in the lower left corner above shows the requisite amount of chocobo feathers needed to gain access to the chest. The lock to the chocobo chick required 60 so I wasn’t surprised that the next one would ask for even more. 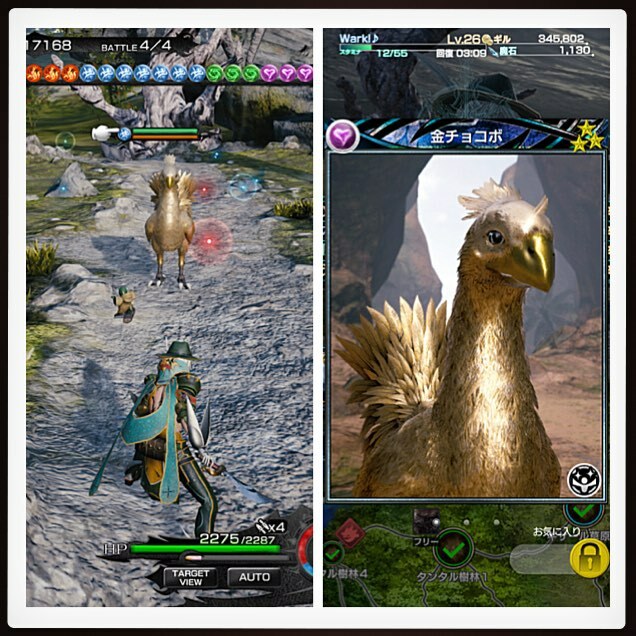 It may be my luck but Gold Chocobos hardly appear during battles with the regular type. (Its silver cousin shows up quite a bit though.) However, it seems that they’re always lying in wait at a spot with a chest or familiar. *__* I’m unsure of the drop rates but I’m hoping that this means that players are guaranteed at least one Gold Chocobo card (shown above), and if not the card, then at least a Rainbow Feather! Sadly, there aren’t enough of those special nodes that’ll allow anyone to max out the abilities of card as there are only 4 or 5. Also, once you complete the battles there, the nodes revert to being normal ones so encountering another golden bird will no longer be a sure thing. 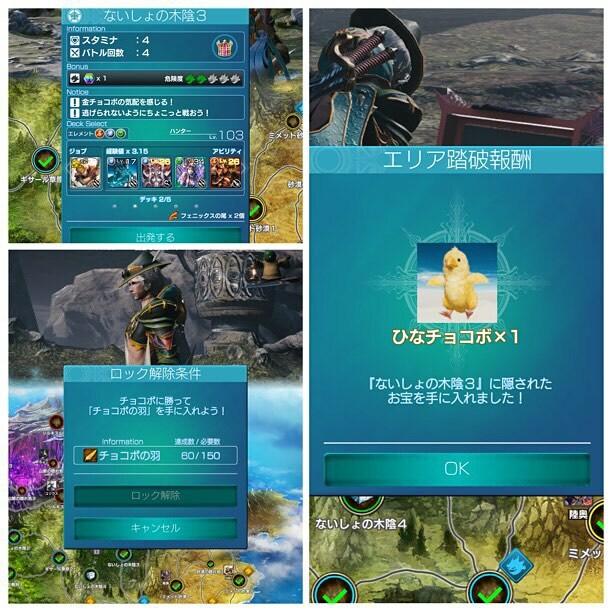 Previous PostMobius Final Fantasy: Fight de ChocoboNext PostMobius Final Fantasy: Fight de Chocobo – The End!